Are you experiencing a dental emergency and looking for an emergency dentist? Are you in pain or have you broken a tooth? Trinity Family Dental offers $35 Emergency Exams. 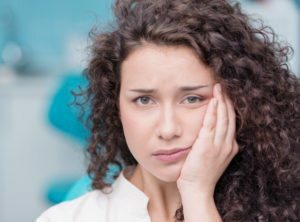 Tooth pain isn’t just inconvenient – a dental emergency can be embarrassing, painful, and traumatic. Fortunately, you’ve got a great emergency dental team on your side at Trinity Family Dental. We’re just a phone call away and we prioritize seeing urgent cases on the same business day. If you are suffering from intense pain that doesn’t respond to medication and it is after our normal business hours, you should proceed to the nearest emergency room near you. The same is true if you have excessive bleeding that won’t stop. You may need more than simple dental treatment. Otherwise, the first thing you should do is stabilize your tooth and the bleeding. Rinse away any debris and gently bite down on gauze or a tea bag to stop blood flow. If you’ve lost a tooth, try to locate it, rinse it gently, store it in a container of milk, and immediately bring it to our office. Missing fillings or crowns can be stabilized with a temporary dental cement you find in a local drugstore. Place an ice pack on the side of your face to dull any pain. You can also take a painkiller your doctor has approved of. Unless a broken filling/crown is making it impossible to proceed with your normal activities, you can usually afford to schedule your appointment with us at your earliest convenience. La Mesa and El Cajon residents need a dental office they can count on in times of emergency. If you encounter an unexpected dental problem, call Trinity Family Dental. We welcome emergency patients of all ages — including young children. We will do our best to see you that day. If your emergency happens after hours, existing patients can call Dr. Shen on his cell phone. All emergency calls go straight to him so that he can talk you through what steps you should take. Contact us today for a healthier smile tomorrow.